Kate Rademacher grew up outside of Boston and now lives in Chapel Hill, North Carolina with her family. In her debut memoir, Following the Red Bird: First Steps into a Life of Faith (2017), Kate describes how she came to embrace a relationship with God after maintaining a pick-and-choose approach to spirituality for many years. Raised in a staunchly secular, liberal community, Christianity was never a path she had seriously considered. Married to a devout Buddhist, Kate was sitting on a cushion at her husband’s meditation center one day when Jesus appeared unexpectedly in her consciousness and called her to follow him. She was baptized a year later to the day. 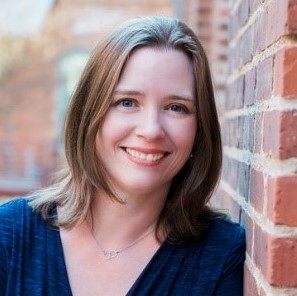 A graduate of Wesleyan University in Connecticut and the University of North Carolina at Chapel Hill’s Gillings School of Global Public Health, Kate’s professional work is focused on international public health. She is currently working on her second memoir about her experience as a foster parent.